How does heart failure start? The Heartbeat Trust and St Michael’s Hospital in Dun Laoghaire are home to the STOPHF initiative – which offers screening to prevent heart failure, a service aimed at prevention and early detection. The screening initiative is where individuals (over 40 years of age who have one cardiovascular risk factor such as high blood pressure or diabetes) have a simple blood test which can predict those at risk of not just heart failure but other cardiovascular diseases, allowing more focused care to be directed to these at individuals. The programme began in 2004 as a research project with the main aim of assessing if people with risk factors for heart failure could have their risk defined by the use of a blood test known as Natriuretic Peptide (NP). NP is a protein that is released from the heart when it is under stress or strain. The results of the research study were positive and STOPHF is now a routine clinical service supported by the Heartbeat Trust. When in the STOP-HF screening programme, a nurse takes a small blood sample to test NP levels. Higher-than-normal results suggest that a person is at risk of developing heart failure, and the level of NP in the blood is related to risk severity. The blood test only takes a few minutes after which the results will be sent to your GP. On the day you may also have an echocardiogram (ultra sound of your heart). If the tests show high risk, there is no need to be alarmed. It is time to get proactive. Recommended action on your cardiac health would involve following nutrition and exercise plans delivered by the expert team at The Heartbeat Trust and may involve taking certain medications to help get you back on the right path. After the assessment, the nurse and doctor review the visit and all test results. If there are any concerns the participant will be asked to come in to the hospital to be reviewed by a doctor and have further investigations if necessary. Automatically, whether the participant is seen by a doctor or not, a letter with all investigation results is sent to their GP. All participants are educated in how best to manage their risk factors for heart failure including diet and lifestyle. If you are a suitable candidate for the STOPHF test you will need to be referred to the STOPHF clinic by your GP. HOW TO PARTICIPATE IN SCREENING? In STOPHF people over the age of 40 who have one cardiovascular risk factor, such as high blood pressure or diabetes, have a simple blood test which can identify those at risk of not just heart failure but other cardiovascular diseases and then tailor treatment according to risk. In non-medical terms, the heart produces a protein and this protein acts as a marker to enable the team at The Heartbeat Trust to access your risk. If you are a suitable candidate for the STOPHF test (by virtue of the diagnostic criteria), you will need to be referred to the STOPHF clinic by your GP. If the tests show high risk don’t be alarmed. It is time to get proactive about your cardiac health which involves following nutrition and exercise plans delivered by the expert team at the Heartbeat Trust and may involve certain medications to help get you back on the right path. Visit your GP today and ask about the NP test and STOPHF service based in St Michaels Hospital, Dun Laoghaire, Co. Dublin. For more information visit our website www.heartbeat-trust.ie and you’ll find us on social media too!  One or more cardiovascular risk factors including diabetes, high cholesterol, high blood pressure. The STOP-HF Screening Programme uses these measurements as indicator of risk or warning signals. BNP is a guide to future management of cardiovascular risk factors. The value of this blood test is that it provided additional information on an individual’s heart health independent of other features, including how the patient is feeling. Once this test rises above a certain value, we advise that a heart scan (echocardiogram) is perform as this test is an accurate way of determining the level of stress on the heart. The result of this scan might indicate that other tests are needed but your doctor will inform you if this is required. An elevated Natriuretic Peptide level, independent of the heart scan result, underlines the need for careful attention to the day-to-day management of risk factors. Certain changes may be advised on lifestyle factors. Changes may be made in medicines used to manage high blood pressure, high cholesterol and/or diabetes and you will be advised to always adhere to your medication regimen. With the above changes we have shown that risk is reduced. Not only for heart failure but for other heart ailments such as stroke and heart rhythm disorders. While we follow the Natriuretic Peptide test result regularly do not be concerned if the value does not decline over time, despite your best efforts. We understand that this can happen and it does not imply that your hard work and ours is not having a beneficial effect on your heart. The medical term Heart Failure can sound very frightening it simply means that your heart can’t pump all the blood your body needs. It might be more helpful to think of heart failure as: ‘When the heart is not working as well as it should and needs some medical help’. 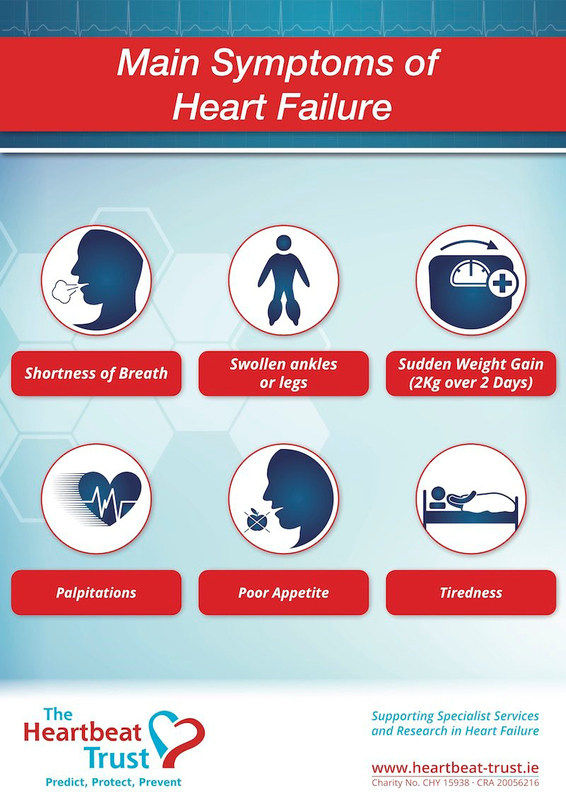 Heart Failure can take years to develop and can be caused by other medical conditions which have put extra workload on the heart or made the muscle in the heart weak or stiff. Heart Failure can develop at any age but is more common in older people and can affect both men and women equally. Recent studies have shown that 1 in 5 people over 40 will develop Heart Failure in their lifetime and at least 15 million adults in Europe live with this condition. STOPHF is aimed at preventing in heart failure by identifying those most at risk. By knowing their risk and working closely with their healthcare team, the patient can take control of their risk, avoid unnecessary hospital visits and live a healthy and active life. The heart is a muscle that pumps blood around your body. The two sides of the heart work together in a cycle of emptying and filling. The right side of the heart delivers blood to the lungs to remove carbon dioxide and pick up oxygen. The left side of the heart fills with this oxygen-enriched blood and pumps it around the rest of the body. With Heart Failure the heart can’t fill or empty as it should. This causes fluid build-up in the limbs, mainly in the feet, ankles and legs. Other symptoms can also develop such as shortness of breath, extreme tiredness, dizziness, and constant coughing at night or when lying down. A lot of the symptoms of Heart Failure can be treated in the comfort of your own home if acted upon straightaway. Better treatments have become available over the last number of years that can help to keep people living with Heart Failure out of hospital and feeling well. Basically, the heart is a pump. Its job is to pump blood containing oxygen and nutrients around the body. But like any pump, it can get clogged, break down and need to be repaired. the walls of the heart may have thickened and cannot relax (rest) as well as they should. You may hear the terms HF-REF and HF-PEF used to describe heart failure. HF-REF describes a heart which does not pump well. Coronary heart disease and heart attack. This is the most common cause of heart failure. Coronary heart disease causes a build-up of fatty material on the inside of the main blood vessels which supply blood to the heart, causing these vessels to narrow and become blocked. Loss of blood supply to an area of the heart results in a heart attack and this can lead to heart failure in the future. High blood pressure (hypertension). If your blood pressure is high, your heart has to work harder to pump the blood around your body. Over time, this can cause the heart muscle to get stiffer and not relax as well as it should (HF-PEF). It may also cause the heart to get weaker over time (HF-REF). Heart valve function abnormality. Sometimes one or more of the heart valves get narrower or leak. This puts extra strain on the heart and, over time, may lead to heart failure. Myocarditis. This is an infection of the heart muscle. Very rarely, people who get a bad cold or flu can develop heart failure as the body’s defence system causes inflammation and damage to the heart muscle. Dilated cardiomyopathy. This is where the heart muscle does not contract well (HF-REF) but the cause is unknown. It may be genetic and your doctor may suggest asking your relatives if they know of similar problems in the family. Dilated cardiomyopathy from the effects of toxins such as alcohol or some recreational drugs. For some people, drinking alcohol or taking other substances may damage the heart. Your doctor may advise you to reduce your drinking for a while, or to stop drinking completely. On rare occasions, some cancer treatments may cause permanent damage to the heart. Abnormal heart rhythm (arrhythmia). This causes your heart to beat too fast, creating extra work for the heart. Over time, this can weaken the heart. Heart problems you are born with (congenital heart defects). In some people, the heart doesn’t develop properly. This means the healthy parts of the heart have to work harder to pump blood. Over time, this can lead to heart failure. Other diseases. Diabetes, some lung diseases, thyroid disease, anaemia, or a build-up of iron (haemochromatosis) or protein (amyloidosis) can also cause heart failure. Very rarely, women may develop heart failure during or following pregnancy. There are a number of risk factors for developing heart failure. The most common risk factors are explained below. Cancer survival has improved over the years, due to newer and better forms of treatment with chemotherapy and radiation. When treating cancer, some of the treatments may cause damage to your heart. This is especially true if you are at risk for heart disease. The combination of earlier cancer diagnosis and advances in cancer care over the last decade has lowered the cancer mortality rate, but has also led to more patients being at risk of cardiovascular disease. This is the most common risk factor for heart failure. Coronary heart disease causes a build-up of fatty material on the inside of the main blood vessels which supply blood to the heart, causing these vessels to narrow and become blocked. Loss of blood supply to an area of the heart results in a heart attack and this can lead to heart failure in the future. Cardio-oncology is a new program supported by the Heartbeat Trust, aligned with STOPHF dedicated to the caring of patients with cancer who are either at risk for developing heart disease (due to their cancer treatment) or who have already developed a cardiovascular issue. This multidisciplinary team of doctors, nurses and healthcare professionals is dedicated to caring for patients in every stage of cancer treatment who are at risk for, develop or have established cardiovascular disease. The goal is to help patients complete their cancer treatment without developing such damage. We use blood tests, heart tracings (ECG) and heart ultrasounds (echocardiogram) to identify and immediately treat heart toxicity. Our care does not change or interrupt cancer therapy. HOW WILL THE SERVICE CHANGE CURRENT THERAPY? As is standard, before treatment patients will get an echocardiogram. At that visit patients will also receive a blood test that measures levels of heart enzymes (including NP). After each cycle of your chemotherapy, patients will be asked to attend St Michael’s Hospital 1-3 days later for a repeat blood test of the heart enzymes; the results of these tests are available within 30 minutes. If the enzyme levels are normal, patients will continue with treatment as usual. If the enzyme level is abnormal, patients will have a repeat ECG and echocardiogram on the same day, and a review with one of the team. They will discuss the meaning of the test results, and potential therapies needed to protect the heart if needed. Chemotherapy will not be stopped unless there is a dramatic change in your heart function, and the cardiologist will always discuss this with your oncologist, who makes the ultimate decision.